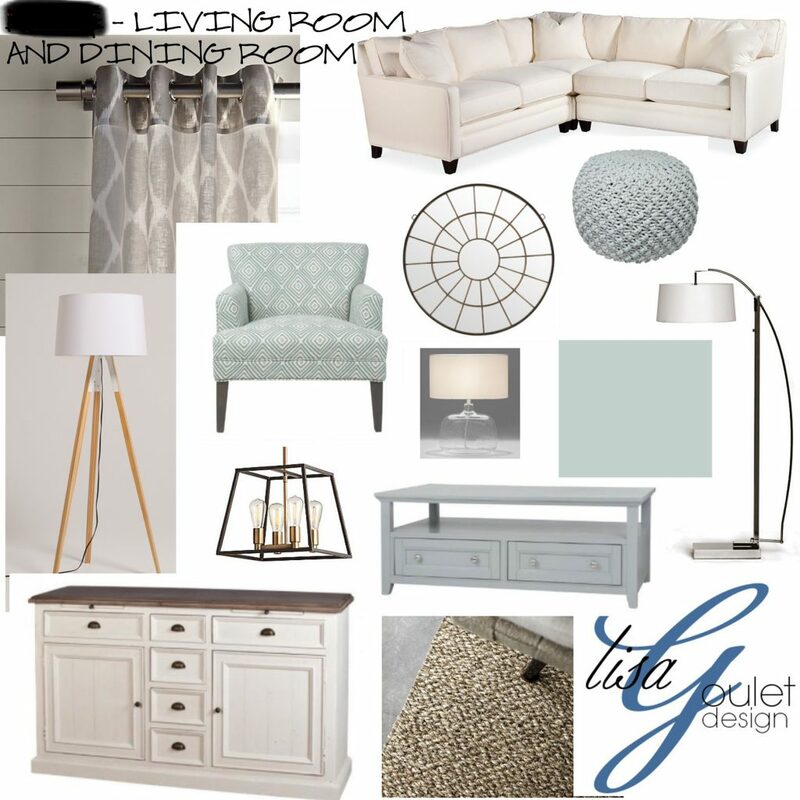 Are you looking for help to furnish a room? Here’s my six steps that you can follow to furnish your perfect space. 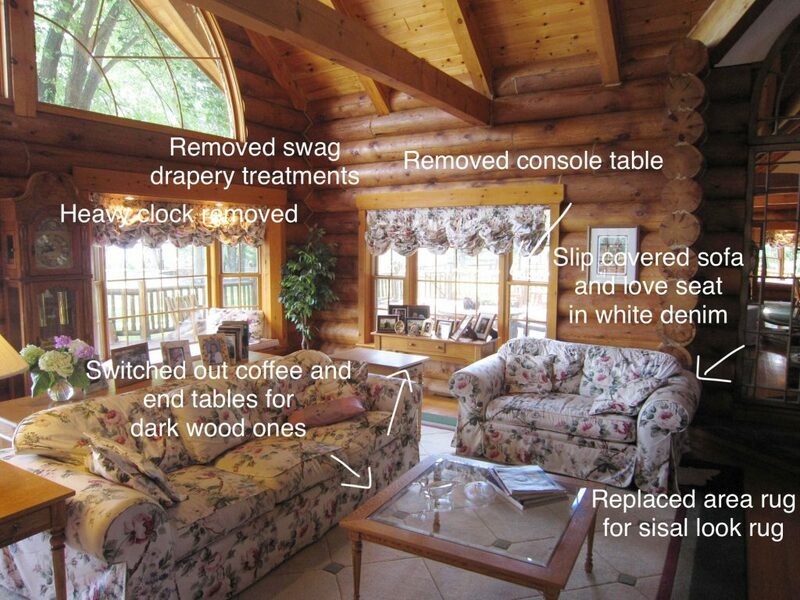 I’ll be using one of my client’s living room as an example. Click here to see the original post. Here’s the before so you can see where we started from. So you can see from the before pictures that we were basically starting from scratch the only thing that we kept was the television. The first thing I asked this client was questions on how she wanted the room to function. This is key to having a room that works for you and your family. Form always follows function. 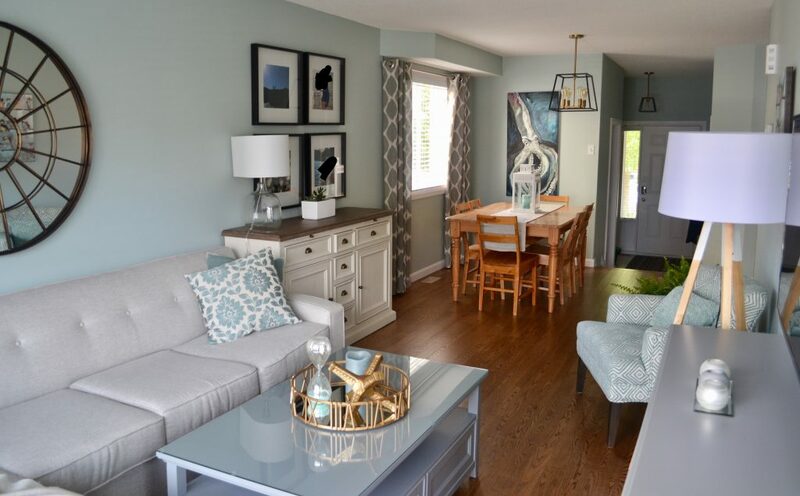 For this client, she wanted space for her and her son and to entertain guests. 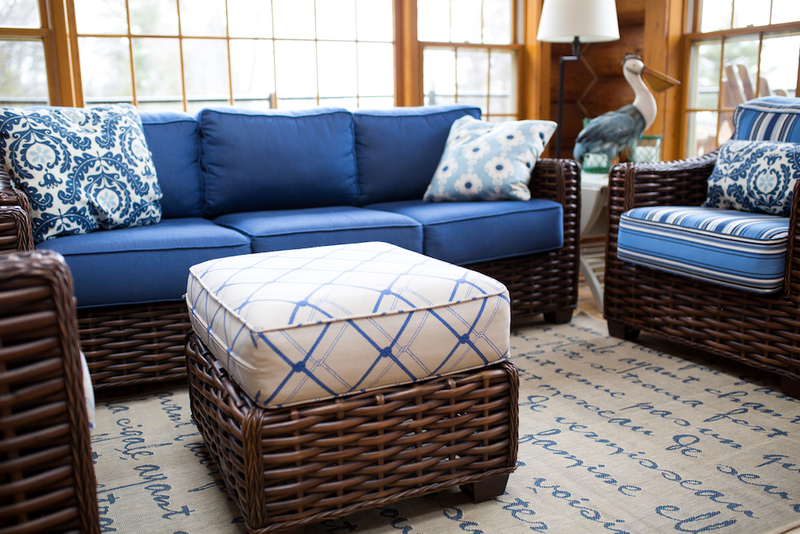 She knew she needed more storage, better lighting and comfortable seating. She also wanted to address the drapery treatment and was already planning to put in hardwood floors. I also ask my clients how they want the room to feel. This really helps to fine tune your design choices. 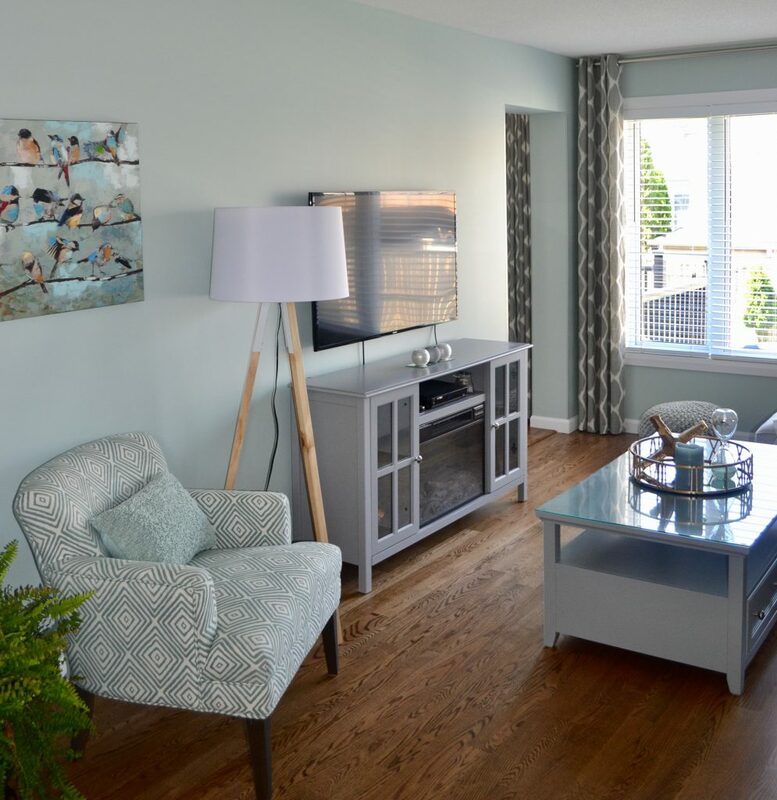 This client wanted fresh, beachy and bright. So take a moment to think how you want your room to function and feel. So once you have the function question answered, draw up a little sketch or use an online program of your space. I use the paid version of Room Sketcher but they do have a simplified free version available here . Better Homes and Gardens has one as well. I haven’t used it but you can click here to go to their site. Play around and see what works. This is the key step you need to furnish your room. At this point don’t be too concerned with colours, these design plans often have limited colour choices, right now you are most concerned about what will fit. 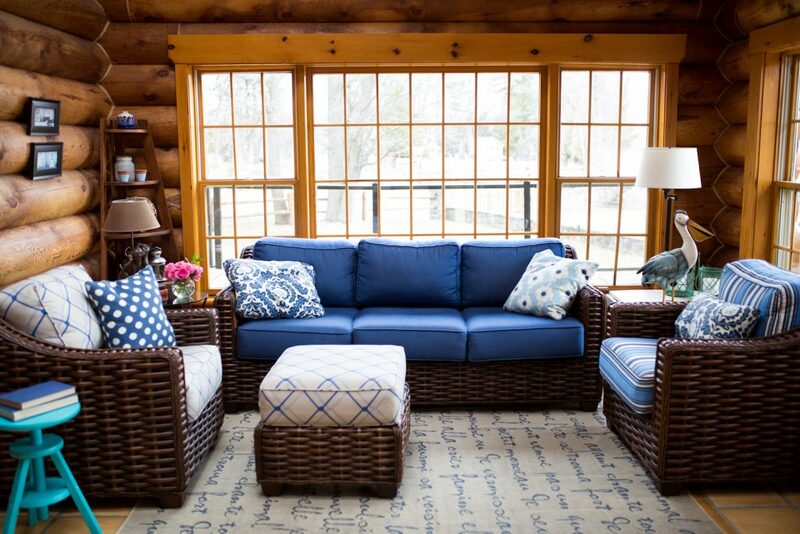 If you are looking at your family room and you need seating for 4-6 people. Well, now you can decide whether you want a sofa that is long enough for napping, with a love seat and a chair. Or do you want two love seats and two chairs? This is where you will see what will actually fit and what won’t. Keep in mind that you need a minimum of 3-4′ of space for traffic flow areas and that coffee tables should be at least 18″ from sofa/chairs to be useful and comfortable. 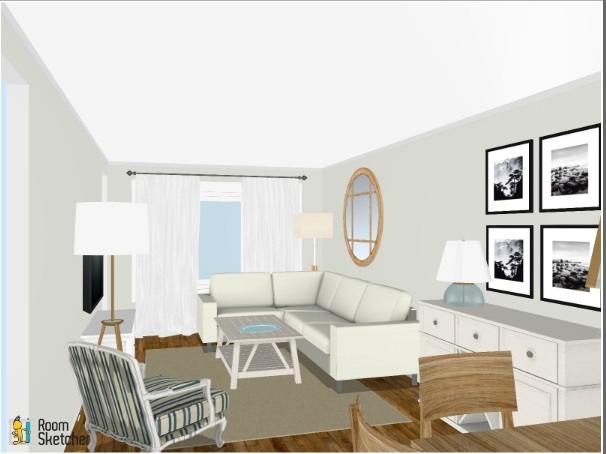 Here’s what the living room and adjoining dining room layout looked like for this client. If the program has 3D rendering it will really help you visualize the space. 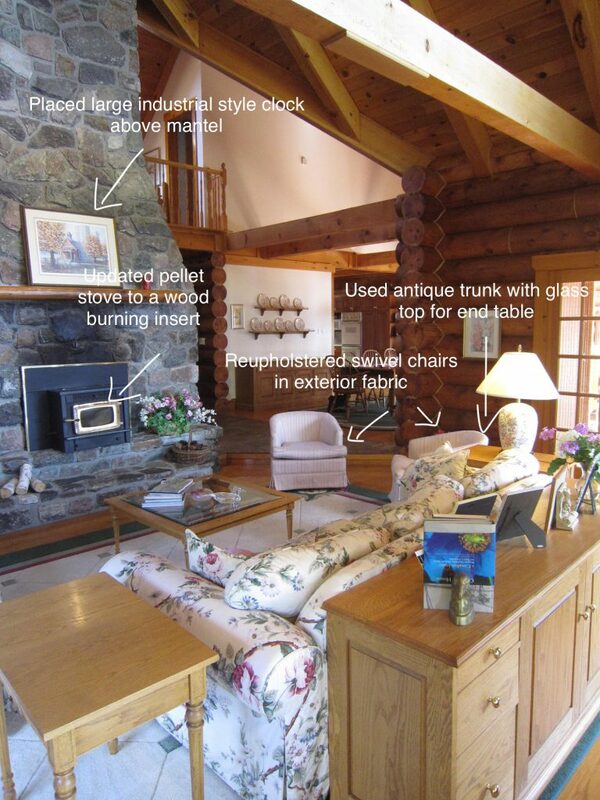 I find it very useful to help clients visualize and for deciding on item’s heights. This is also where I focus of the shapes of items. Since most furniture is square or rectangle I try to incorporate some round, oval or irregular shapes to balance the design. A sectional worked well in this small living area and maximized the seating as well as comfort factor. A colourful occasional chair adds some pattern and can be pulled up closer to the sectional when company is over or even used at the dining table when needed. 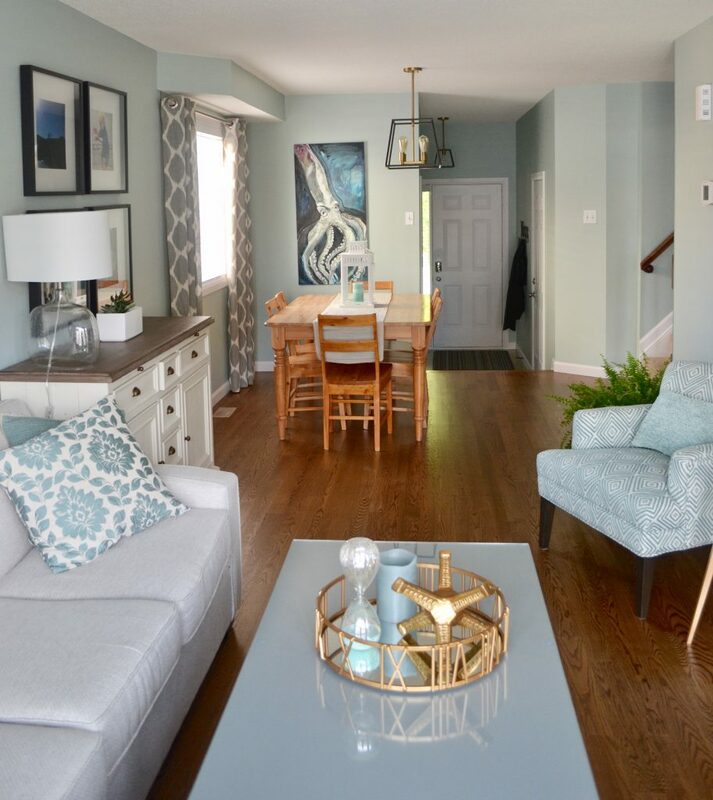 A television console with cupboards, a large coffee table with drawers and shelves and a dining room buffet situated between the living room and dining room offers storage for both rooms. 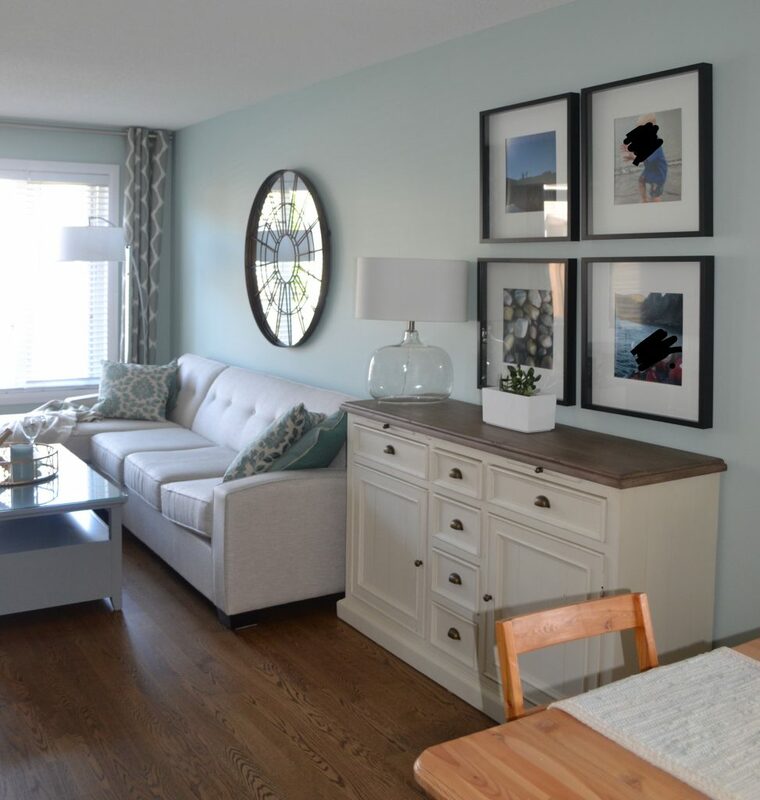 It also gives her a place to put a larger table lamp and add in a small gallery wall. 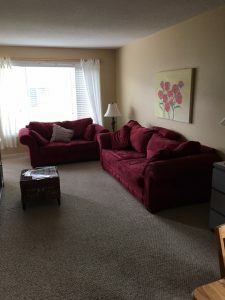 My client ended up going with a sofa with a chaise lounger at one end instead of a full sectional as she didn’t want to block too much light from the window. The key here was she knew what size of sectional/sofa would work and then she went shopping. She also decided to wait on getting an area rug and see if she really missed having one or not. Design is fluid and often Plan B or Plan C is utilized as you go along. Now make a list of the pieces you will need to furnish this room. Perhaps you will be using something you already have. Just make sure that the dimensions work in your layout. Remember to measure everything so that you don’t have any unexpected surprises. It’s also very important to measure your main door frame or any stairs to ensure you can get any larger pieces of new furniture in your house or up or down the stairs!! This is also where you want to think about window treatments. Do you need blinds and drapes, or just blinds. Is privacy or sun protection an issue? If so, you definitely want to ensure you have blinds or at least lined drapery. Also don’t forget the lighting and smaller case goods, like end tables, foot stools, night tables, etc…. 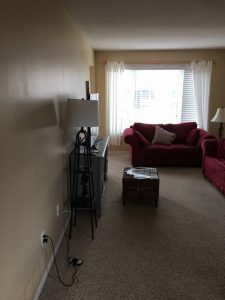 This is the best place to play with placement and see if you can fit in a floor lamp or perhaps even a large house plant in that corner. Here is the mood board for this project. This was done up together with a list of items to be ordered/purchased and their costs. We can’t forget the budget. It really does make some decisions for you. I am a splurge and save kind of gal, as I love a few luxury pieces but then my practical side comes in. I LOVE to find a bargain or perhaps repurpose or reuse an item. Make up a spreadsheet with the list of the items you need to purchase/find on the left and then start sourcing with your budget in mind. As you go along you will have to decide where to splurge and where to save or perhaps plan for a larger purchase over time. Now this is where the colour scheme comes in. Are you using some existing pieces? Use them as your guide. 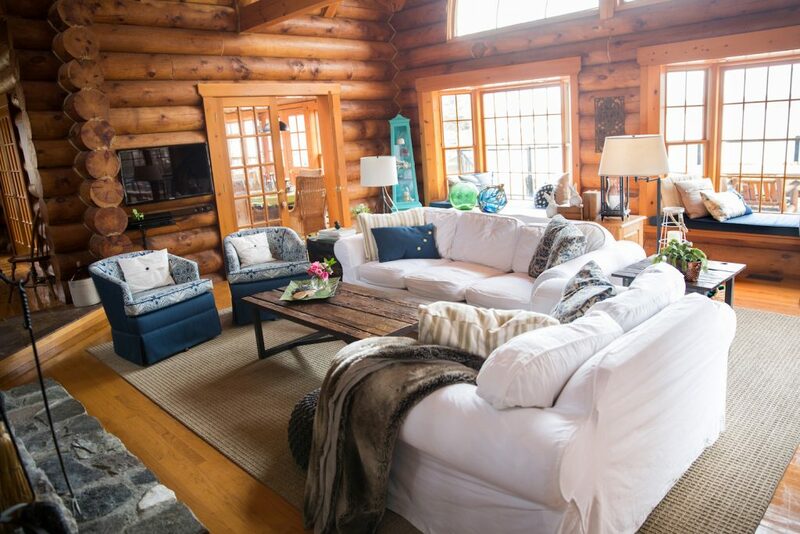 An area rug, art piece or even the fabric on a throw cushion can be your jumping off point for the colour scheme. 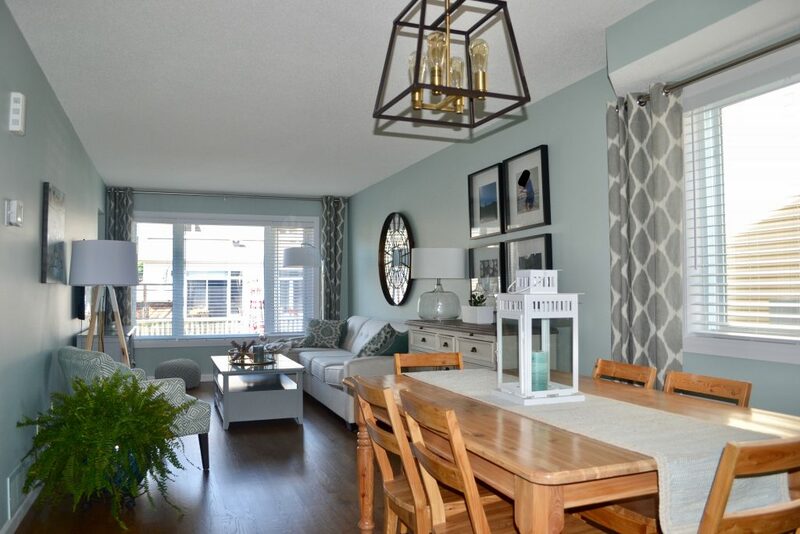 Keep in mind the colours in the rest of your home and how much light this room gets. If this is a main room, you want to ensure that it won’t clash with the hallway or other rooms adjacent to it. If you need further inspiration or are starting from scratch, look around your home, what is your favourite room? What colours are in there? Or do a Pinterest search and just start pinning rooms that you love. A common colour thread will emerge quickly. Once you have decided on the colours of all the major pieces you can now choose a paint colour. Paint colours should always come last. As it is much easier to choose a paint colour to go with your sofa fabric than the other way around. Once you have made all these decisions and ordered your furniture you can start the fun part. Accessory shopping! You can either shop your home or hit the stores for the finishing touches. I like to keep at least 10% of the budget for accessories. Don’t skip this step, it gives your room it’s personality. Buy more accessories than you think you’ll need so that you can try them out in your space. Just make sure that there is a good store exchange policy so that you can return the items that are not needed. Now sit back and enjoy your perfect space. And if all of this seems way too complicated or time consuming for you, just contact me. I’d be happy to help design your perfect room. Whether from start to finish or by just giving you the design plans to do it yourself. It’s entirely up to you. Boy, it’s a hot summer here so far. 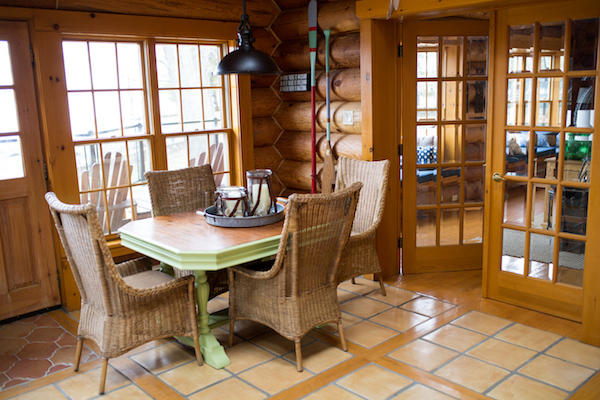 So in honour of the season, I’m sharing my log room sunroom that I designed and furnished when we bought our log home a few years ago. 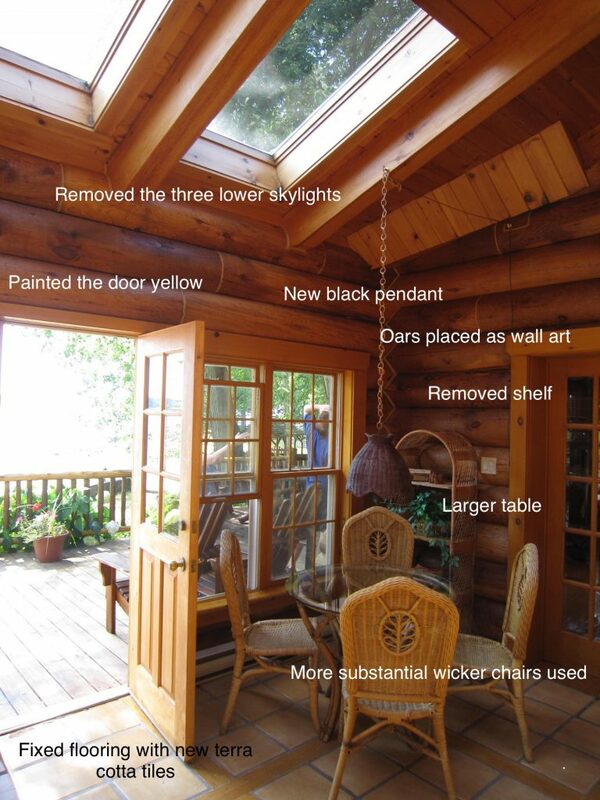 So whether your sunroom is actually a covered porch, a screened in 3 season room, a Muskoka room or a free standing gazebo, these tips will help you. 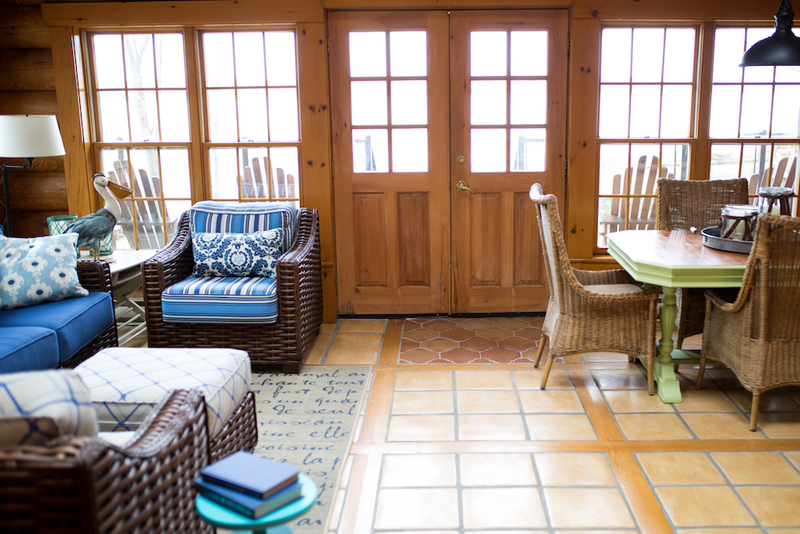 Here’s how one side of the sunroom looks now. 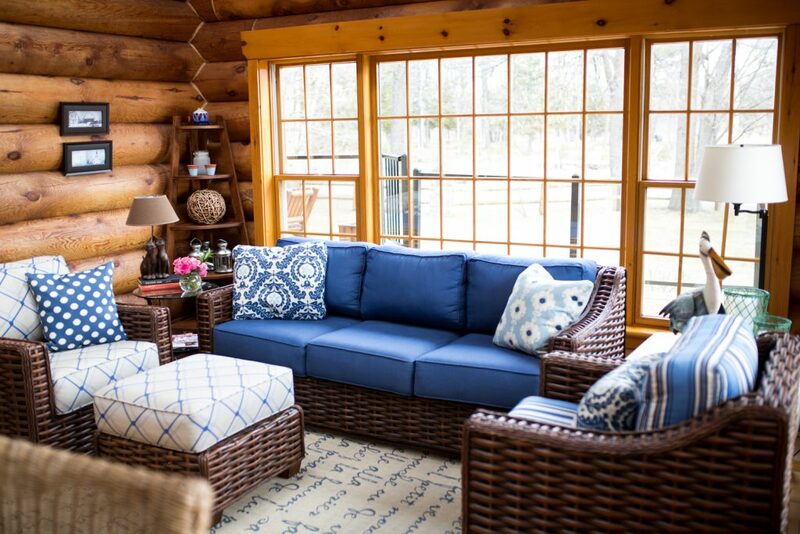 I bought more substantial and darker wicker furniture and had the cushions made with sunbrella fabric so that there was no worry about sun damage or a wet bathing suit. 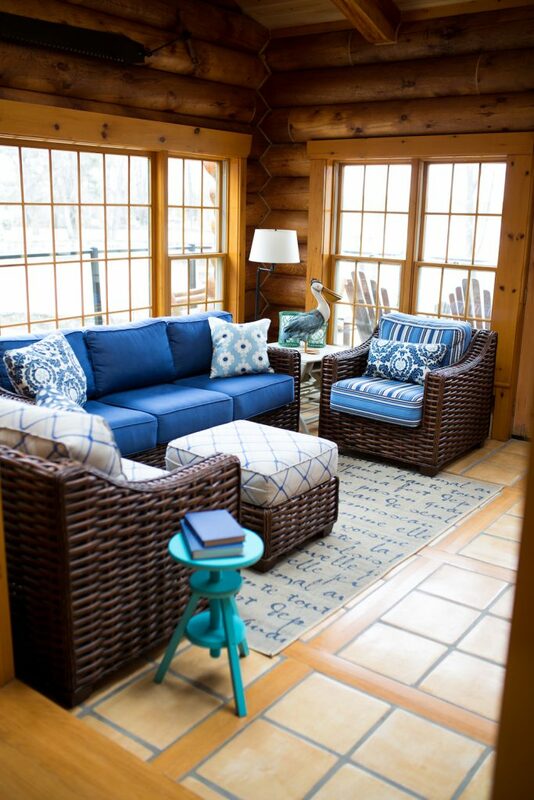 I chose blue fabrics that complemented each other but that were not the same for interest. Instead of a coffee table I went with an ottoman. It can be used for your feet, as an extra seat or for putting a tray on and using as a table. 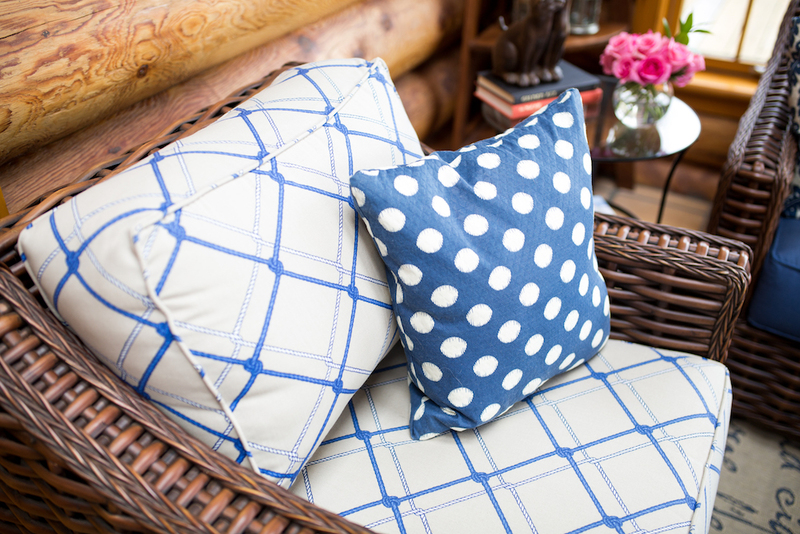 The various throw pillows were made by me and I selected more contrasting patterns but with the same colours of blue as in the upholstery. 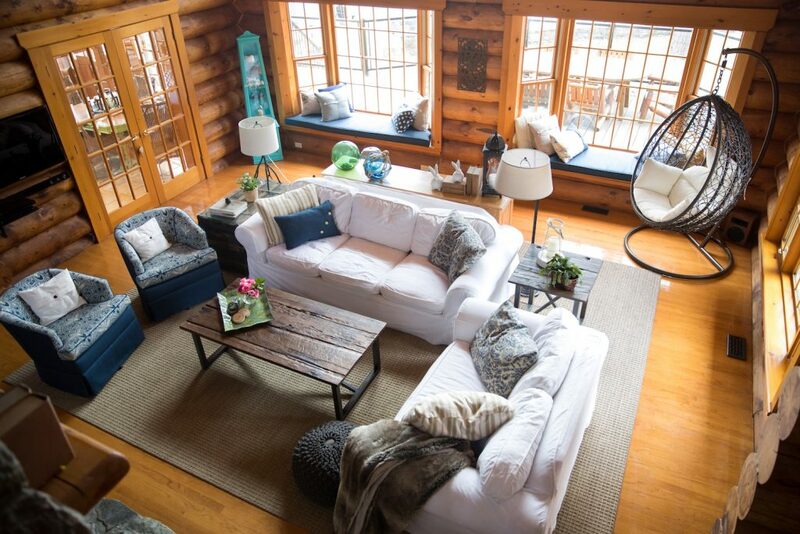 I primarily used blue in this room but with little touches of a soft green. 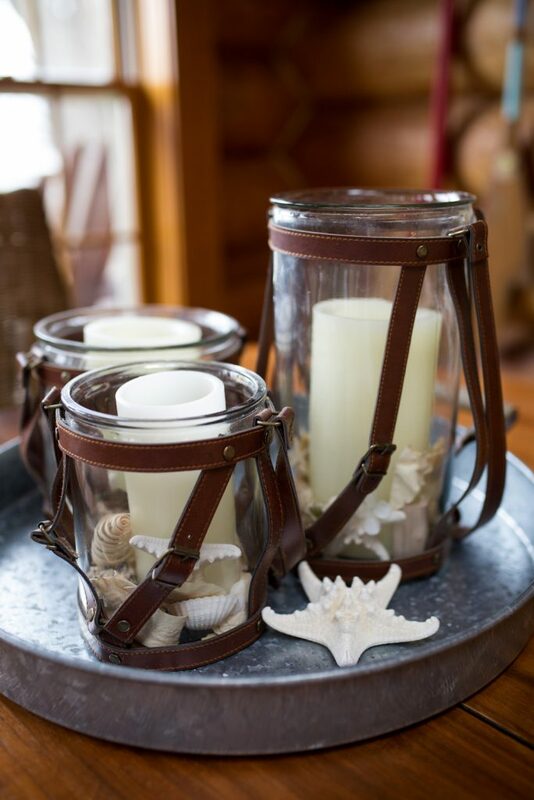 It shows up on the table base, on candle holders and on a few other decorative accessories. A small corner shelf adds a little display area and makes the corner interesting. 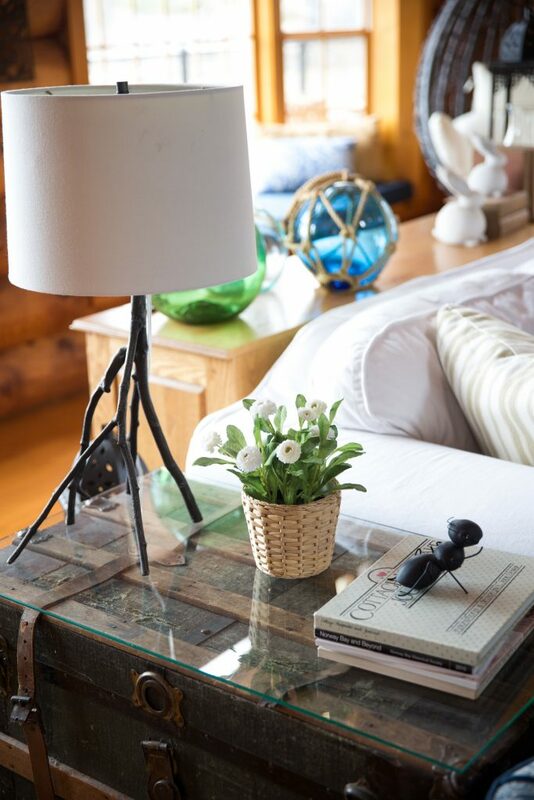 A little round glass table holds a table lamp and in the other corner a larger table is for display and to place a drink or two. A floor lamp brings much needed light into this corner. My grandfather’s ice saw from the early 1900’s takes pride of place over the window. You can just see it on the picture below. 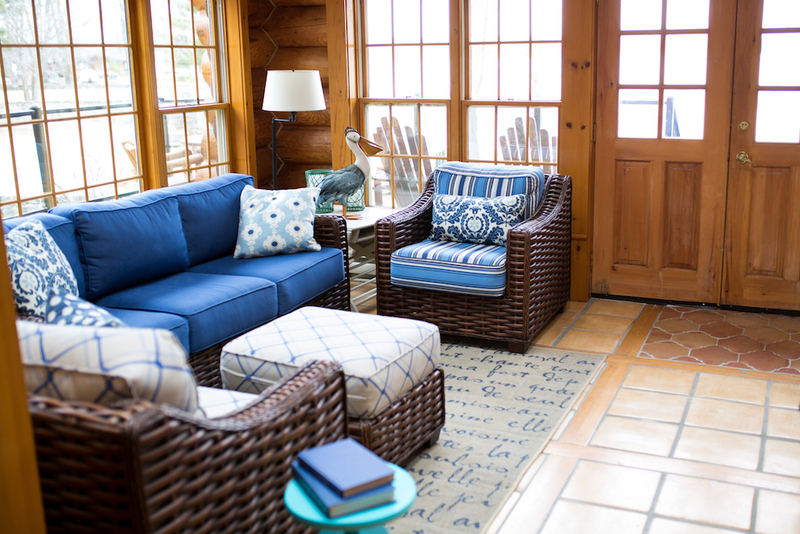 An indoor/outdoor rug with a fun french poem written on it anchors the seating area. 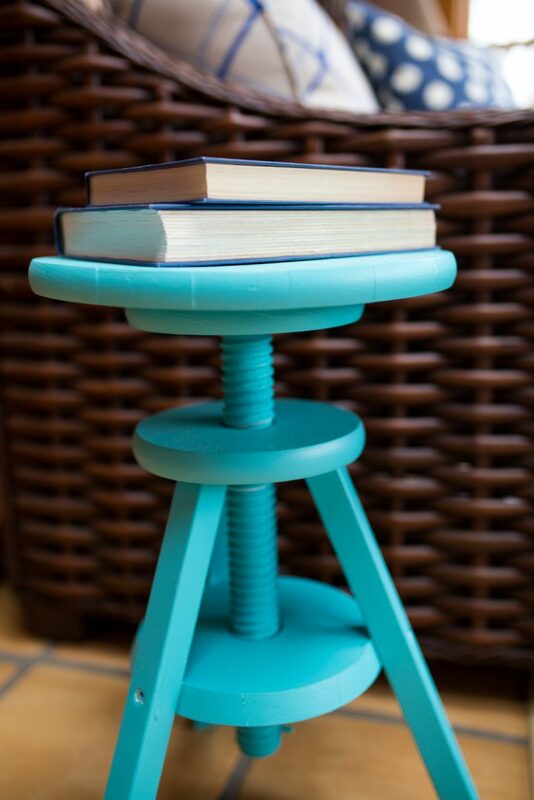 The little piano stool, from a barn sale, is painted a fun turquoise that matches the curio cabinet in the living room. And here’s how the other side of the room looked like before. First up we had to do a repair on the floor tiles right in front of the door. Since the existing terracotta tiles were not available nor would they have matched I went with a different pattern terracotta tile for this area, I think it makes it look like an accent rug. We also took out three of the six skylights as the lower ones were too close to the edge of the roof and leaked all the time. We kept it as an eating area and this is also where we often play cards. Removing the shelf allowed for a larger table and chairs. I also hung a black industrial style pendant light. And for a little bit of fun, I painted and placed some old oars as wall art on this wall. The other side of the room, which you don’t see has a large bookcase across from the table. And there are two sets of french doors which take up the rest of the wall space. 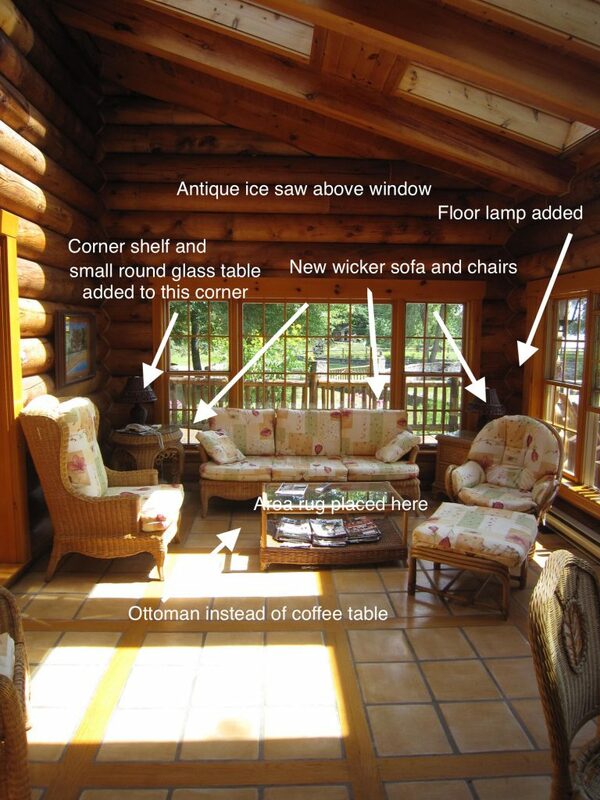 If you’d like to read about the other rooms in my log cottage, click on the links below. And stayed tuned, as I’ll be sharing more of the rooms throughout the summer. 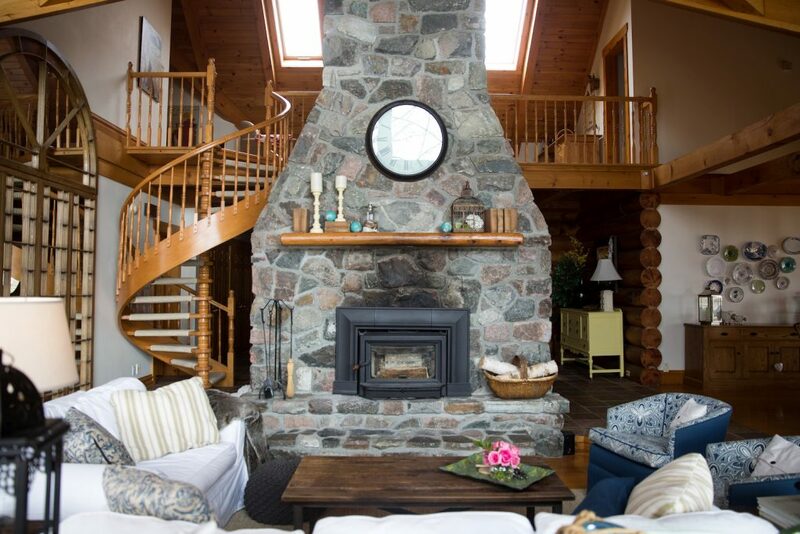 You can also read about my log cottage feature online in Ottawa at Home’s summer edition by clicking here. It’s that travel time of year! The time of year when we dream about hitting the open road with clear blue skies above. I may be in the minority but I love a road trip! Well, let’s be honest I love any kind of trip. But I do not love clutter! 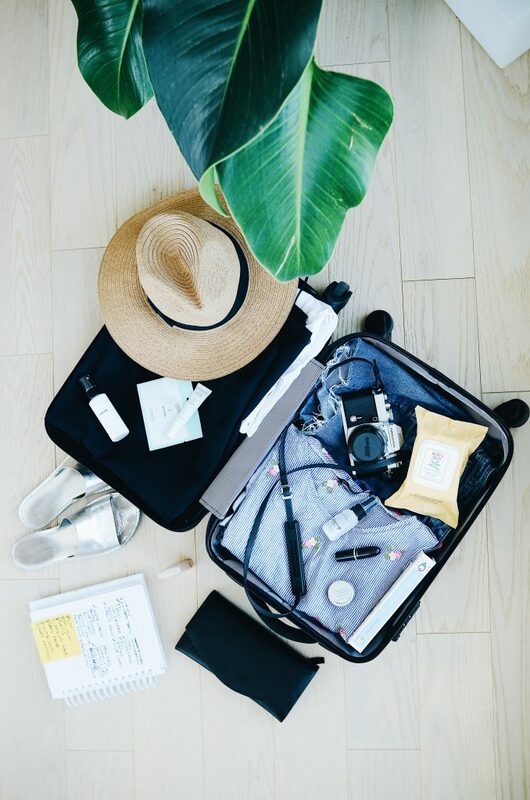 So regardless of where you are headed this summer, you will likely bring back a souvenir of some sort. But then you get home and that bright Mexican plate that you just couldn’t part with in the market, just doesn’t quite look as good in your very traditional home. 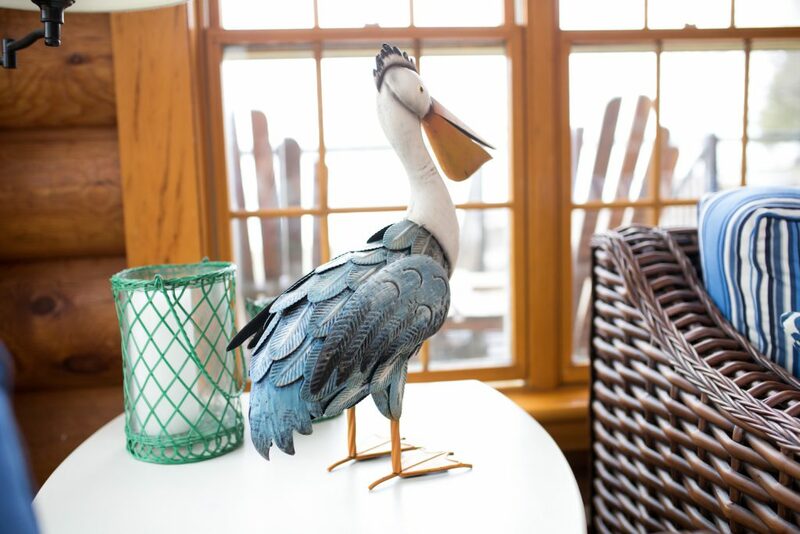 So what souvenirs can be turned into decor pieces that don’t just clutter up your home? When I’m traveling, I think about these things before I pick up something that’ll also take up my precious luggage space. Where will you use or place it in your home when you get back? 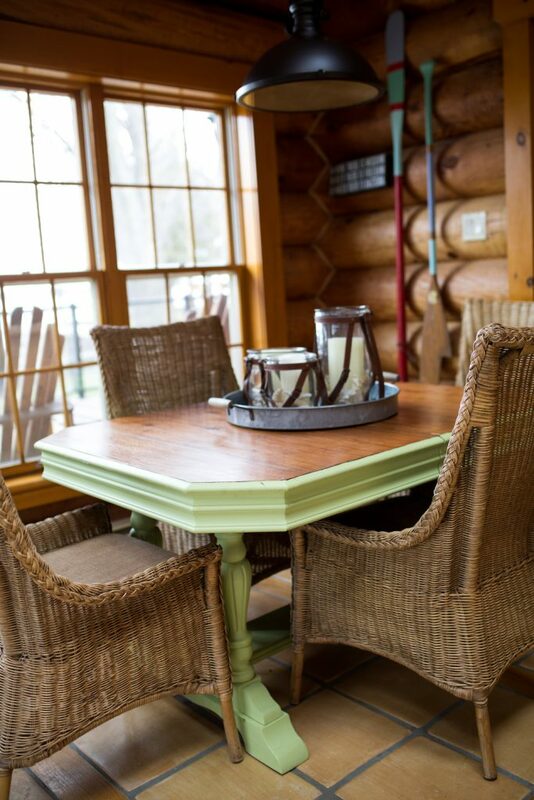 A colourful ceramic bowl or jug may be perfect thing to use at your summer cottage instead of your home. Is it useful or at least tasty? I often pick up speciality food products that are unique to the locale, it’s great to enjoy and share with friends or family when you’re back home. Picking up Christmas tree ornaments are perfect for remembering your vacation but they won’t add to your daily clutter quota. Plus they are usually tiny and therefore easy to pack. Textiles are another favourite, a tea towel with a cute local saying or image or perhaps, an apron, both are useful. When I went to Paris, I picked up fabric at a flea market and once home, I had it made into cushion covers. 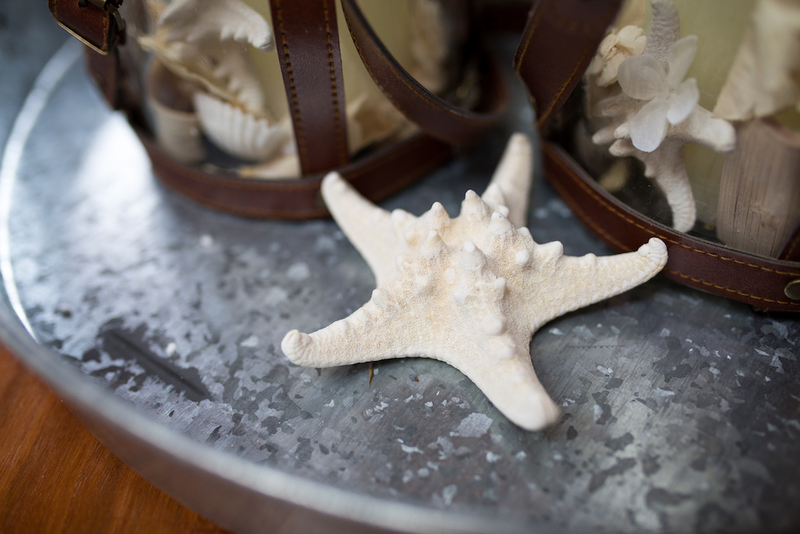 Perhaps you can pick up some seashells, sea glass or special rocks from your vacation spot. Once you’ve ensured you can remove them, collect away. By placing them in shadow boxes or displaying them in a bowl you can enjoy them year around. Kids of course, love to get in on this type of collecting and it’s easy on the vacation budget. Do you take a million travel pics? I must confess I am guilty of this. But it’s great to pick one or two of your favourite and have them blown up and either mounted or framed for your walls. I’ve also made a personalized calendar with travel pics from the previous year. It’s a great way to remember the special moments. So where are you heading this summer? 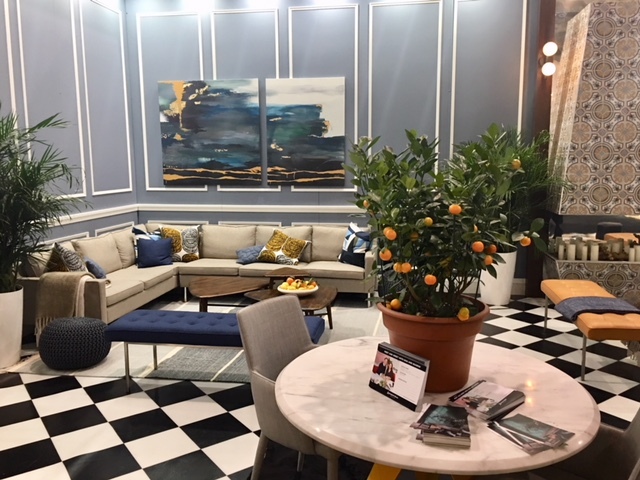 I’m just back from Toronto’s Interior Design Show (IDS18) that was held last weekend. And I thought I’d share a few of my observations about the show over the next while. 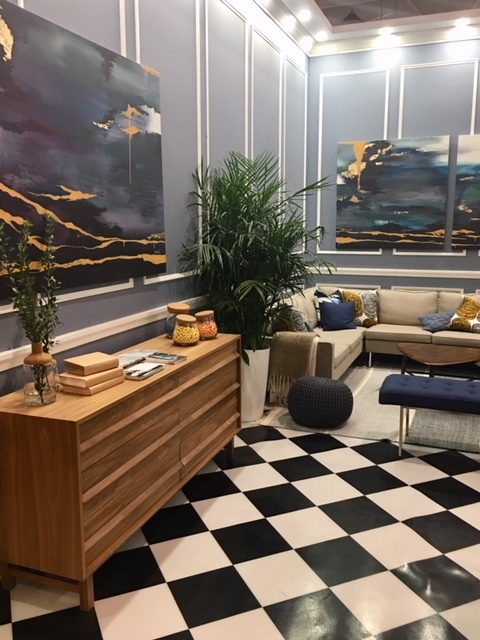 For me, the Benjamin Moore booth totally summed up the show and what’s happening in decor at the moment. 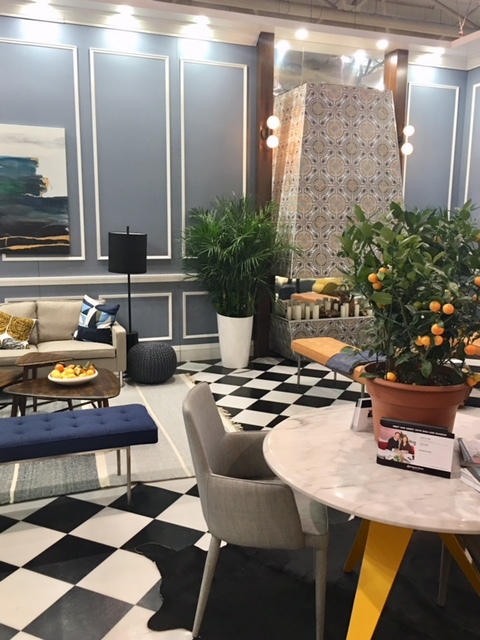 It had the pattern (in the tiled floor and the fireplace), the neutral and jewel tones (in the furnishings and artwork), and the greenery that was everywhere. And it was eclectic, the envelope of the room was traditional with the black and white checked floor and panelled wall treatment, the fireplace was mediterranean inspired and the furnishings were all mid-century modern. Could you live in this space? I certainly could.